The Driver's License pictured is covered with a plastic Laminate exactly like a regular U.S. Driver's. Each Alien Driver License is a copyright product, a copyright stamp has been placed on these pictures to insure non duplication. 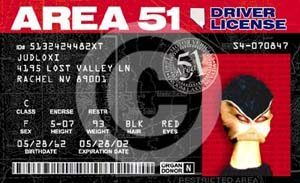 Alien Driver Licenses you will be purchasing will NOT have the C copyright imbedded on the front of the license. Actual size is 2.875" wide by 1.75". FREE shipping within the United States. Regular retail price is $9.95 per.